The shocking case of an unrepentant migrant nanny from Central Asia killing a four-year-old girl and parading her head has shaken Russians and prompted civil society to ponder over the role Russia should play in the region. Some former Soviet republics in the region have struggled to cope since they became independent, making them potentially easy prey for ISIS. The reality of what happened near the Oktyabrskoye Polye metro station in Moscow on the "extra" day of February is still too difficult to comprehend and accept. Yet it happened, we have not only to believe, but to somehow live with it. Two days later, it became clear that the crime had been committed not by a crazy but quite sane person: Gyulchekhra Bobokulova, the ‘nanny’ of the four-year-old girl, talked about how she had killed the child, calmly and without a shred of fear or remorse, and was provocatively ironic in court, hiding behind Allah. When questioned, Bobokulova said the murder of the child was her response to the Russian bombing campaign in Syria. She does not have the appearance of a terrorist, she is not a suicide bomber strapped with explosives, but Islamic ideologues who have declared war on Russia have done a good job of warping her mind. Her behaviour, the way she hides behind Allah and talk of revenge looks like a cool, calculated expression of pure venom and is intended to initiate a reciprocal wave of mass and uncontrolled aggression; an ethnic and religious massacre. An Uzbek national, instigated by a Tajik national, Bobokulova who was dressed in a black robe associated with Islamic State (ISIS), while waving the head of a murdered child and threatening jihad, is now smiling at the camera and blaming Russian troops for her crime. How could anyone, even the most sensible person, avoid exploding with rage? Meanwhile, social networks obligingly offer posters showing the crossed-out depiction of the outrageous scene with the killer nanny holding the child's severed head in her hands. This image – looking as if it has been taken from ISIS manuals on how to intimidate their victims, a message to the unfaithful, threatening to kill those dearest to them, to cut off the head of their future – is being enthusiastically replicated by so-called patriots, Russian nationalists and even the Communists, playing into the hands of religious extremists, whom Russia is fighting in Syria. In many ways, this is meant to provoke the average Russian person to lose balance and to provoke a wave of hatred against all migrants from Central Asia and for Muslims in general, which would ultimately prove suicidal for Russia. Acting on her own or on orders from terrorists, Bobokulova could detonate inter-ethnic and inter-faith peace, which has more or less settled in Russia in recent years, giving the signal for mutual slaughter. Her ghastly crime could result in possibly orchestrated attacks from right-wing football fans against migrants from Central Asia. After that, in the event of a lethal outcome, the situation could go out of the control of law enforcement agencies. Perhaps it is the fear of such a scenario that has prevented major television channels, with the Kremlin's consent, from reporting on the killing and broadcasting the ISIS-like image of the killer nanny. There is no doubt that ISIS and other terrorists will intensify work in this direction and try to commit repeated terrorist attacks. Losing in the open conflict in Syria to the Russian air force, they and their overseers are well aware of the weakness of Russia's southern underbelly and the opportunity to use the inhabitants of Central Asia as suicide bombers and distributors of extremism. ISIS activity has been seen in Uzbekistan since November 2015, and even earlier in Tajikistan. In response to this threat, the ideas of introducing a visa regime with Central Asian countries, as well as all sorts of barriers against migrants, all the way up to complete expulsion, are becoming increasingly popular in Russian society. 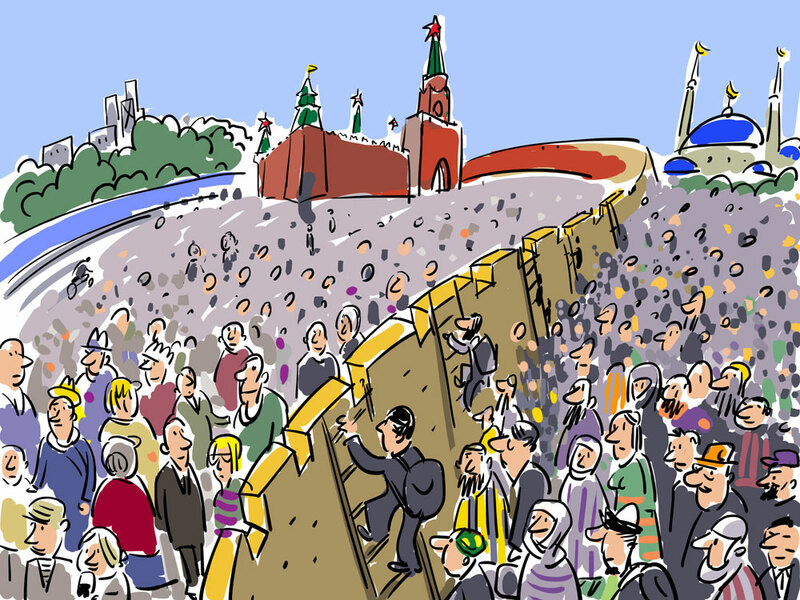 Some even discuss the need to build a "Great Eurasian Wall." In fact, we are talking about a total detachment from this region, which is strategically important for Russia. However, this is a superficial solution to the problem. The relationship with Central Asia is actually a test of the maturity of the Russian Federation as the successor to the Soviet Union and the Russian Empire. For the last three centuries, the Asian vastness has been included, in one way or another, in the political space of Russia. Even before that, the Russians always interacted with the population of the large steppe, since there are no natural barriers between us.In response to this threat, the ideas of introducing a visa regime with Central Asian countries, as well as all sorts of barriers against migrants, all the way up to complete expulsion, are becoming increasingly popular in Russian society. Some even discuss the need to build a "Great Eurasian Wall." In fact, we are talking about a total detachment from this region, which is strategically important for Russia. Having turned into a Eurasian empire, Russia just needed to become the cementing force for the diversity of the peoples of this vast area. Offering the Russian state system to them, our ancestors inserted them into the Russian civilization on an equal footing, while preserving the Asians' national identity, but at the same time offering their rules of life and values as universal. After the collapse of the Soviet concept of coexistence, the Central Asian nations thought they could do without the Russians and would live even better without the Russian state. In the very first 20 years, the humanitarian, state and technological degradation of the newly independent countries reached an incredible pace and put millions of people in Central Asia virtually on the brink of extinction. It turned out that they once again have to resort to Russia for salvation, this time in the role of unskilled guest workers. Unfortunately, modern Russia has failed to provide other ways to restore our relationship, but it has been at least a prerequisite of survival for the Central Asians. However, for the Russian state, which is going through difficult times to overcome its collapse and recovery, there has been at least some opportunity to keep the extremely important region, which is not called Central Asia for nothing, in its political orbit. Any attempt to somehow dissociate itself from this center, to isolate themselves, to artificially turn Asian nations into barbarians outside the perimeter of "white civilization" will lead to a situation in which Russia will prevent itself from developing, will set unnatural limits for itself and allow other civilizations to use these countries and their population against itself, in particular as material for a new ISIS army. The opinion has been abridged and edited.